Two thirds of voters are not satisfied with the information they get about Maryland laws, regulations and taxes, according to the results of a mobile phone survey being released Thursday by the OpenGov Foundation. OpenGov, a nonpartisan, nonprofit organization focused on using technology to make public information more accessible, also found that 78% of Maryland voters want advance notification about Maryland policies that will impact them. “I was actually surprised at how high the level of dissatisfaction was with just the quality of information people were receiving,” said Seamus Kraft, executive director at the organization. The surveys were an informal tracking poll that is intended to help show the organization how much progress toward transparency has been made as they begin their efforts. The foundation called mobile phone numbers and got responses from 614 Marylanders who identified themselves as registered voters. The report also includes breakout of younger voters (ages 18-49) and older voters (ages 50 and up). Those results showed 74% of younger voters are not satisfied with the information they currently receive and 77% want advance notification. 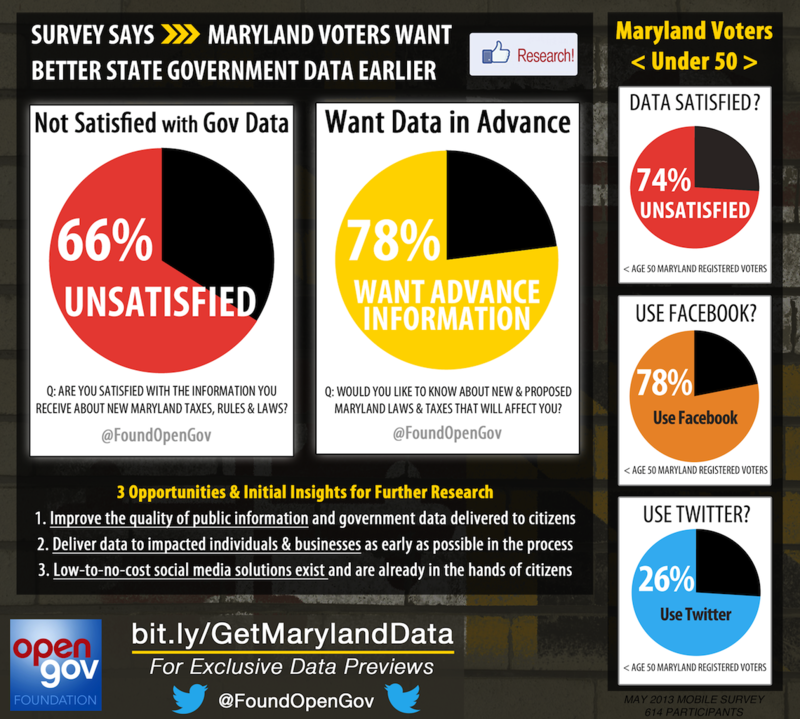 Results of the survey were mailed to Maryland legislators on July 30 and OpenGov has invited them to start a dialogue on the issue. The foundation is focusing its efforts on improving transparency in Maryland and Baltimore, with the goal of creating tools and processes that can be duplicated in other U.S. communities. Making public information more accessible and interactive is a problem “really crying out for Silicon Valley problem solving abilities and execution abilities,” he said. The report also focuses on how many voters use social media like Twitter and Facebook – with more than half of all voters using Facebook and 19% using Twitter. Among younger voters, those numbers go up to 78% and 26%, respectively. Kraft said those numbers show that Maryland government can use social media tools already available without any new software development to reach voters better that won’t cost the government or voters anything to use. “We see those numbers as opportunities” Kraft said. If the goal is to distribute user-friendly information for an accountable government in a timely fashion, Kraft said they can get halfway there simply by relying on social media that voters are already using. The foundation wants to work on open source software to make government more transparent to get Maryland the rest of the way to the goal. In another story on opening government information, the Legislative Watch website provides full voting records for Assembly members. To better understand the state’s challenges to political transparency, the OpenGov Foundation and MarylandReporter.com teamed up to lead a small focus group last Thursday to analyze the access point to all of Maryland’s State House information — the state legislative website. The conclusion? Transparency in Maryland has a long way to go.